I’m an edge-of-the-brownie kinda gal. I eat the edges first, and they’re my favorite part. There’s just something about that crisp/chewy/fudgy edge that I can’t resist! Luckily, my husband and kids like the centers so it works out well. Unfortunately, there’s only so much edge in a pan of brownies. I slightly underbake my brownies to keep those middles a little fudgy. Since I underbake them, the middles fall a little as they cool, which makes the perfect little dip to set a scoop of ice cream in. Preheat oven to 375 F. Grease and flour a 12-cup muffin tin. Set aside. 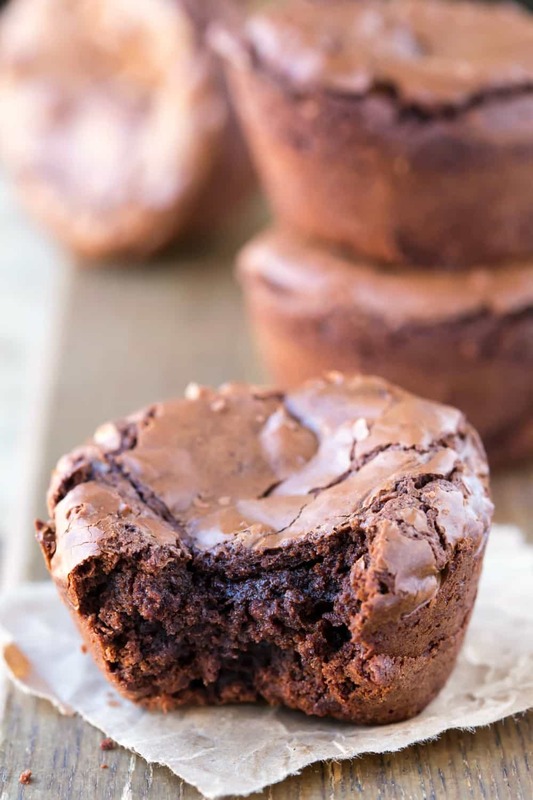 Make sure you really grease the muffin tin so that the brownies don't stick. How can Anyone enjoy your video’s with a pop up ad every second or two?I for one cannot keep watching without shear frustration! Hi! I’m sorry that the ad on the video frustrates you, but the alternative would be for me to require people to pay to view all of my recipes and videos. The reason that you see ads on videos on my site and every other site is because videos are costly and time-consuming to produce. The ads on the video and elsewhere on my site enable me to have the time to make and test the recipes, purchase costly video and photography equipment, produce videos, and take the time to answer questions and concerns. do you have to use dark chocolate? 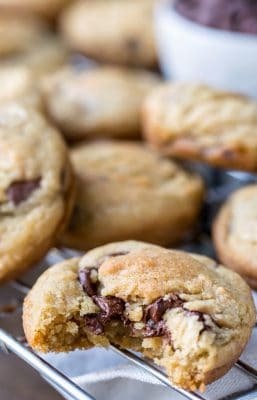 can you use milk chocolate chips? You’re just going to get a sweeter brownie. Otherwise, I think milk chocolate chips would work! 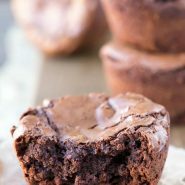 Are you using regular size muffin tin or mini-muffin? And if I want to use a mini-muffin tin, what adjustments should I make to baking time? I use a regular sized muffin tin. I’m sorry, but I haven’t tried this out with a mini muffin tin, and I’m hesitant to tell you what adjustments to make without having tried it. I used a brownie mix. They baked nicely in the muffin tin, I did find out though that I should have let them cool longer before I tried to take them out of the tin. Can you use the small muffin tins? I’m sorry, but I don’t. I’m hesitant to offer adjustments that I haven’t tried out. These look yummy! What is the best way to store them, short or longer term? Can they be successfully frozen? Thank you! I store them loosely covered with plastic wrap. They’re good for about 2-3 days. I think they could be frozen, but I haven’t tried freezing these brownies. I’ve frozen other brownie recipes, and these should freeze fine, too. If you have any other questions, please feel free to ask! Perfection!! I followed your recipe to a T and the brownies came out perfect. Thanks for the recipe!! I’m so glad you liked them! Thanks for taking the time to come back and leave a comment! How many calories is in one brownie? Thank you for asking! I just added the nutrition information underneath the recipe. 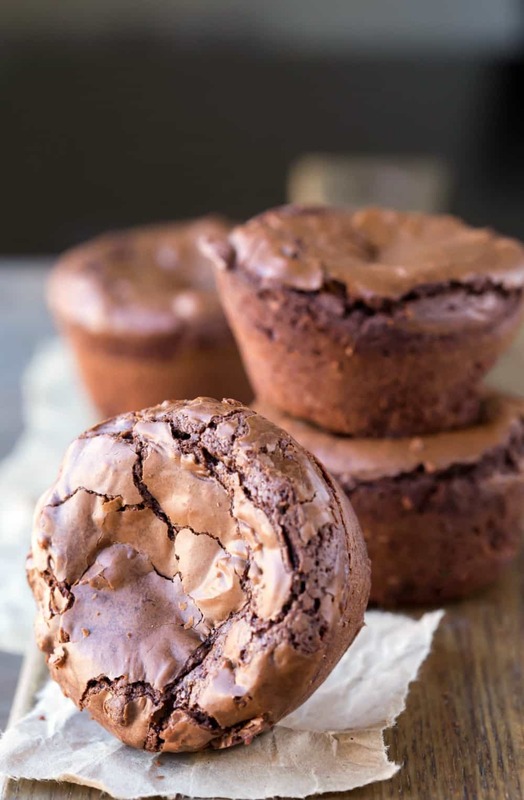 I always use liners when I bake brownies in a muffin tin. I also spray the liners with baking spray. Works out very well! Great tip! Thank you! I’ve also had good luck with the parchment cupcake liners. They have a nonstick coating on them, and everything seems to come right out. Can I bake these in a 9×9 square pan? If so, how long do I need to bake them? I’m not sure! I haven’t tried to make them as regular brownies. If you’re looking for a regular brownie recipe, either my better than box mix brownies or frosted brownies may be a better fit. 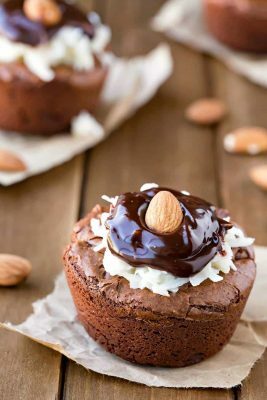 I would never bake these again in muffin tins without a paper liner. Nightmare to get out – they’re fishy so they stick, but too soft and crumbly to try to pry out without falling apart. They can be difficult to get out of the pan, which is why I called that out in the directions. I grease my pans well with nonstick baking spray with flour in it, and I don’t have issues getting them out. Paper liners may help, but you may find that you need to grease the liner as well. Also, if you find that you’re having trouble getting something to release from a muffin tin, I’ve found that letting it cool completely helps with any crumbling issues. I haven’t tried baking them in mini muffin tins, so I can’t say how they would turn out or how long you would need to bake them for. I would guess that they would work though. Since you can always bake them longer, I’d try cutting the time in half and checking them until done. Good luck! 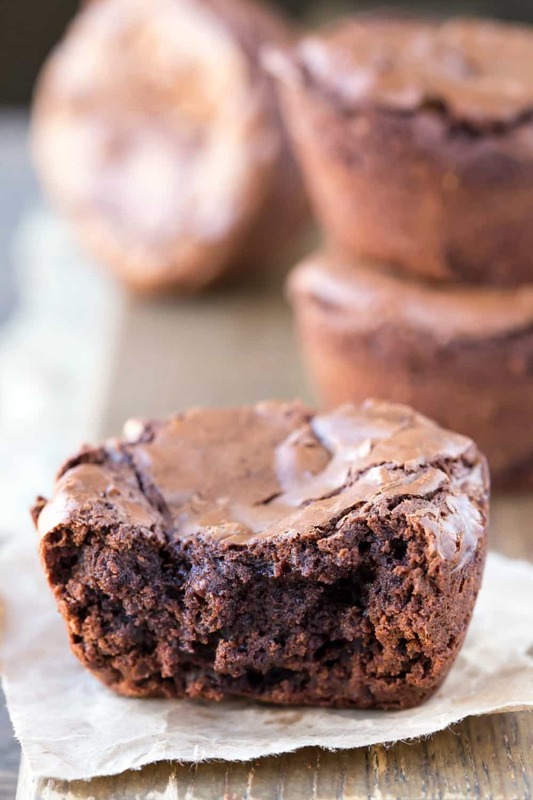 I baked these in a mini muffin pan for about 13 minutes and they were perfect. Thank you Hillary. Weekend project!